We managed to get some pretty good press this year. 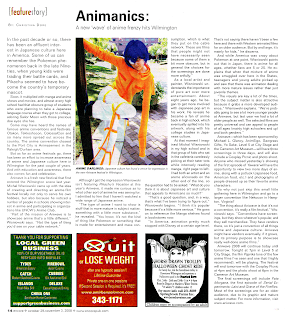 Thanks to Christina Dore, who wrote the article on Aniwave for Encore (left). She did an excellent job, and managed to get a lot of information into the article on what Aniwave is all about, and why my motivation for doing it is. Also, the photograph was provided by Analie Foland, so a big thanks to you as well! On Tuesday, October 28, Wilmington's WWAY Channel 3 reported on Aniwave during the five o'clock news. A synopsys of that report can be read on their website here. I should have the video of this to upload in the near future. In addition, I'd like to thank Jemila Ericson of WHQR, who got our announcement on air. And last but not least, thanks to John Staton at the StarNews for putting an anouncment obout Aniwave in the paper as well.